Methanobrevibacter sp. 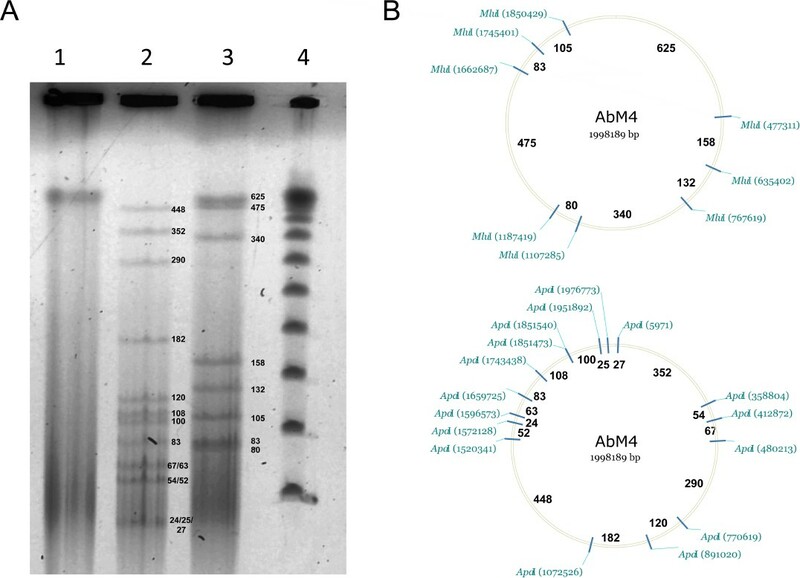 AbM4 was originally isolated from the abomasal contents of a sheep and was chosen as a representative of the Methanobrevibacter wolinii clade for genome sequencing. The AbM4 genome is smaller than that of the rumen methanogen M. ruminantium M1 (2.0 Mb versus 2.93 Mb), encodes fewer open reading frames (ORFs) (1,671 versus 2,217) and has a lower G+C percentage (29% versus 33%). Overall, the composition of the AbM4 genome is very similar to that of M1 suggesting that the methanogenesis pathway and central metabolism of these strains are highly similar, and both organisms are likely to be amenable to inhibition by small molecule inhibitors and vaccine-based methane mitigation technologies targeting these conserved features. The main differences compared to M1 are that AbM4 has a complete coenzyme M biosynthesis pathway and does not contain a prophage or non-ribosomal peptide synthase genes. However, AbM4 has a large CRISPR region and several type I and type II restriction-modification system components. Unusually, DNA-directed RNA polymerase β′ and β″ subunits of AbM4 are joined, a feature only previously observed in some thermophilic archaea. AbM4 has a much reduced complement of genes encoding adhesin-like proteins which suggests it occupies a ruminal niche different from that of M1. Methane formed in the ruminant fore-stomach (reticulo-rumen) is a significant source of greenhouse gas emissions for countries that are reliant on ruminant-based agriculture. Methane is an end product of plant digestion in the reticulo-rumen, and is formed by methanogens belonging to the Euryarchaeota subgroup of the Archaea. Molecular surveys of ruminants have shown that small subunit ribosomal RNA gene sequences affiliated with species of the genus Methanobrevibacter predominate in most rumen microbiomes, on average making up almost two thirds of the rumen archaea . Sequences are mainly associated with M. gottschalkii (33.6%) and M. ruminantium (27.3%), but also with M. wolinii (0.1%), M. smithii (0.1%) and other Methanobrevibacter spp. (0.5%). Development of mitigation strategies to reduce methane emissions from farmed animals is currently the subject of both scientific and environmental interest. Methanogens are producers of ruminant methane, therefore methane abatement strategies can either target the methanogens themselves or target the other members of the rumen microbial community that produce substrates necessary for methanogenesis. Genome sequencing has improved our knowledge of the processes that methanogens contribute to rumen function and is already providing information directly applicable to methane mitigation strategies based on vaccine and small-molecule inhibitor approaches [2,3]. Mitigation technologies for methane emissions from ruminants should target features that are conserved across all rumen methanogens, and be specific for methanogens so that the remaining rumen microbes can continue their normal digestive functions. Targeting ruminal methanogens using vaccine and small molecule inhibitor approaches needs to take into account the phylogenetic diversity covering the different groups of methanogens within the rumen and capture the inter-species diversity within a genus. Our group is sequencing the genomes of cultured representatives of rumen methanogens  to define their conserved features as targets and to understand their role in the ruminant environment for the purpose of developing methane mitigation technologies. Here, we report the complete genome sequence of Methanobrevibacter sp. AbM4. Methanobrevibacter sp. AbM4 was isolated and purified from the abomasum of a sheep maintained as part of a study into effects of the nematode Ostertagia circumcincta on the abomasal environment  (Keith Joblin, personal communication). 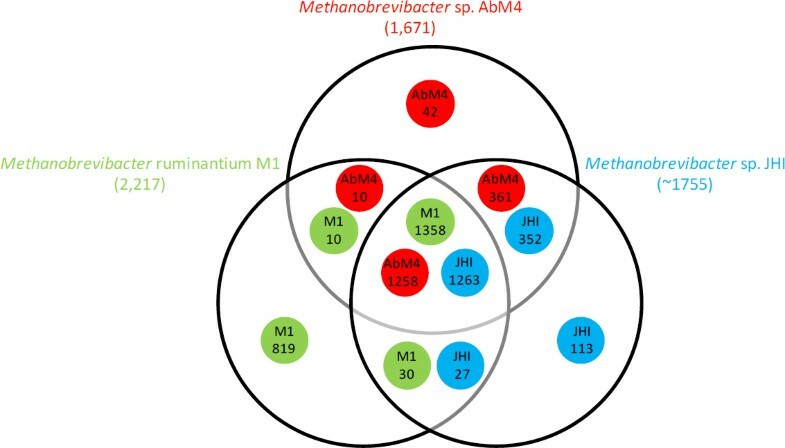 AbM4 is a member of the methanogenic archaea. It is a strict anaerobe and its hydrogenotrophic metabolism is characterized by its ability to produce methane from hydrogen, carbon dioxide and formate. A phylogenetic analysis of the AbM4 small subunit ribosomal RNA (ssrRNA) gene sequence places it closest to Methanobrevibacter wolinii and the sequence is approximately 95% similar to the M. wolinii type strain SH [Figure 1]. Although an ovine abomasal isolate, ssrRNA gene sequences identical, or with >97% similarity to that of AbM4 have also been reported among methanogen sequences derived from rumen contents of both sheep and cattle [8–10]. Searches of the Genbank and the Ribosomal Database Project databases also show sequences >97% similar to AbM4 occur in yak (Genbank accession JF807172), in sheep in Venezuela  and Western Australia , in alpacas  and Jersey dairy cows farmed in the USA , as well as in the feces of manatee in Florida, USA (Genbank accession HQ599703, HQ599742). The cellular morphology of AbM4 was determined by electron microscopy (Fig. 2). For this, AbM4 cells were grown on RM02 medium  and were negatively stained with 1% phosphotungstic acid, mounted on Formvar-coated copper grids. Grids were examined using a Philips model 201C electron microscope. AbM4 is a short rod and is not motile [Figure 2]. 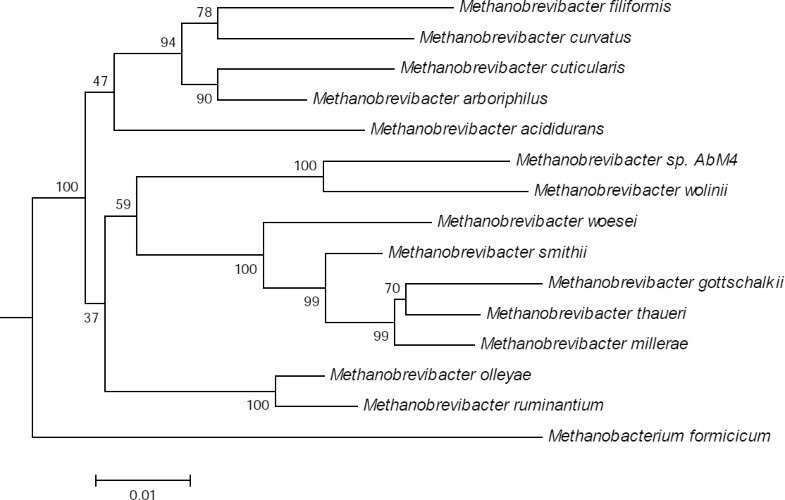 Phylogenetic tree showing the position of Methanobrevibacter strain AbM4 relative to type strains of other Methanobrevibacter species. The strains and their corresponding GenBank accession numbers for 16S rRNA genes are (type=T): Methanobrevibacter gottschalkii HOT, (U55238); Methanobrevibacter thaueri CWT, (U55236.1); Methanobrevibacter millerae ZA-10T, (AY196673); Methanobrevibacter smithii PST, (U55233); Methanobrevibacter woesei GST, (U55237); Methanobrevibacter wolinii SHT, (U55240); Methanobrevibacter sp. AbM4, (AJ550156); Methanobrevibacter olleyae KM1H5-1PT, (AY65201); Methanobrevibacter ruminantium M1T, (AY196666); Methanobrevibacter curvatus RFM-2T, (U62533); Methanobrevibacter filiformis RFM-3T, (U82322); Methanobrevibacter cuticularis RFM-1T, (U41095); Methanobrevibacter arboriphilus DH-1T, (AY19665); Methanobrevibacter acididurans ATMT, (AF242652) and Methanobacterium formicicum DSMZ1535T, (AF169245). The tree is based on these sequences aligned by the RDP aligner, and uses the Jukes-Cantor corrected distance model to construct a distance matrix based on alignment model positions without the use of alignment inserts, and uses a minimum comparable position of 200. The tree is built with RDP Tree Builder, which uses Weighbor  with an alphabet size of 4 and length size of 1,000. The building of the tree also involves a bootstrapping process repeated 100 times to generate a majority consensus tree . Methanobacterium formicicum was used as the outgroup. Transmission electron microscopy of negatively stained Methanobrevibacter sp. AbM4 cells. 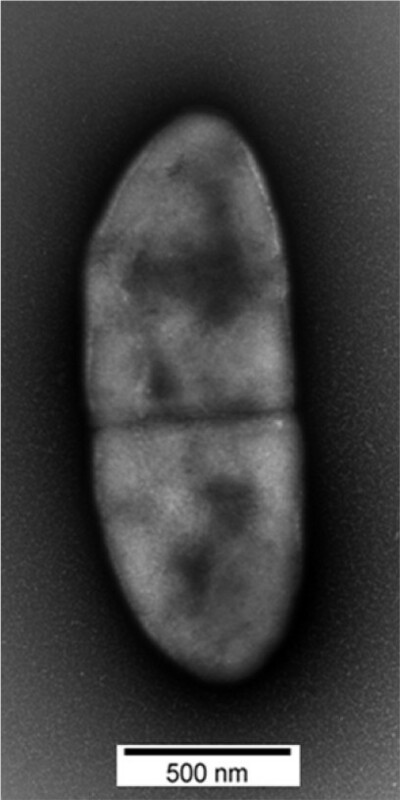 Methanobrevibacter sp. AbM4 was selected for genome sequencing on the basis of its phylogenetic position as a representative of organisms whose nearest relative is M. wolinii. AbM4 was isolated from a sample of sheep abomasal contents, whereas the type strain of M. wolinii SH was isolated from enrichment cultures of sheep feces . AbM4 grows readily in broth cultures making it amenable to experimentation in the laboratory. A summary of the genome project information is shown in Tables 1 and 2.
a) Evidence codes — TAS: Traceable Author Statement; IDA: Inferred from Direct Assay; NAS: Non-traceable Author Statement (i.e., not directly observed for the living, isolated sample, but based on a generally accepted property for the species, or anecdotal evidence) . AbM4 was grown in BY medium  with added SL10 Trace Elements solution (1 ml added l-1) , selenite/tungstate solution (final conc. of selenite and tungstate are 3 and 4 µg l−1 respectively) ; and Vitamin 10 solution (0.1 ml added to 10 ml culture before inoculation) . H2 was supplied as the energy source by pumping the culture vessels to 180 kPa over pressure with an 80:20 mixture of H2:CO2. Genomic DNA was extracted from freshly grown cells using a modified version of a liquid N2 and grinding method . Briefly, AbM4 cultures were harvested by centrifugation at 20,000 × g for 20 min at 4 °C and cell pellets combined into 40 ml Oakridge centrifuge tubes and frozen at −80 °C. The frozen cell pellets were placed in a sterile, pre-cooled (-85 °C) mortar and ground to a powder with periodic addition of liquid N2. Buffer B1 (5 ml Qiagen Genomic-Tip 500 Maxi kit, Qiagen, Hilden, Germany) containing RNase (2 µg ml−1 final concentration) was added to the powdered cell pellet to create a slurry which was then removed. An additional 6 ml of B1 buffer was used to rinse the remaining material from the mortar and pestle and combined with the cell slurry, which was then treated following the Qiagen Genomic-Tip 500/G Maxi kit instructions. Finally, the genomic DNA was precipitated by addition of 0.7 vol isopropanol, and collected by centrifugation at 12,000 × g for 10 min at room temperature and re-dissolved in TE buffer (10 mM Tris-HCl, 1 mM EDTA pH 7.5). The complete genome sequence of AbM4 was determined using pyrosequencing of 3kb mate paired-end sequence libraries using a 454 GS FLX platform with titanium chemistry (Macrogen, Korea). Pyrosequencing reads provided 234× coverage of the genome and were assembled using the Newbler assembler version 2.7 (Roche 454 Life Sciences, USA). The Newbler assembly resulted in 30 contigs across 4 scaffolds. Gap closure was managed using the Staden package  and gaps were closed using additional Sanger sequencing by standard and inverse PCR based techniques. A total of 80 additional reactions were necessary to close gaps, to improve the genome sequence quality and to ensure correct assembly and to resolve any remaining base-conflicts. Assembly validation was confirmed by pulsed-field gel electrophoresis (Figure 3) . Pulsed field gel electrophoresis of Methanobrevibacter sp. AbM4 genomic DNA digested with restriction endonucleases (A) and in silico restriction enzyme maps (B). Panel A: Lane 1, undigested genomic DNA; Lane 2, digested with ApaI; Lane 3, digested with MluI; Lane 4, concatenated lambda marker (fragment sizes, from bottom in Kb, are 48.5, 97, 145.5, 194, 242.5, 291, 339.5, 388 and 436.5). Panel B: Maps of ApaI and MluI restriction endonuclease cleavage sites within the AbM4 genome. A GAMOLA/ARTEMIS [31,32] software suite was used to manage genome annotation. Protein-encoding open reading frames (ORFs) were identified using the ORF-prediction program Glimmer  and BLASTX [34,35]. A manual inspection was performed to verify or, if necessary, redefine the start and stop codons of each ORF. Assignment of protein function to ORFs was performed manually using results from the following sources; BLASTP  to both a non-redundant protein database provided by the National Centre for Biotechnology Information (NCBI)  and clusters of orthologous groups (COG) database . HMMER  was used to identify protein motifs to both the PFAM  and TIGRFAM  libraries. TMHMM [41,42] was used to predict transmembrane sequences, and SignalP, version 4.1  was used for the prediction of signal peptides. Ribosomal RNA genes were detected on the basis of BLASTN searches to a custom GAMOLA ribosomal database. Transfer RNA genes were identified using tRNAscan-SE . Miscellaneous-coding RNAs were identified using the Rfam database  utilizing the INFERNAL software package . The AbM4 genome sequence was prepared for NCBI submission using Sequin . The adenine residue of the start codon of the Cdc6-1 replication initiation protein (Abm4_0001) gene was chosen as the first base for the AbM4 genome. The nucleotide sequence of the Methanobrevibacter sp. AbM4 chromosome has been deposited in Genbank under accession number CP004050. The genome of Methanobrevibacter sp. AbM4 consists of a single 1,998,189 bp circular chromosome with an average G+C content of 29%. A total of 1,730 genes were predicted, 1,671 of which were protein-coding genes. A putative function was assigned to 1,258 of the protein-coding genes, while the remaining protein coding genes were annotated as hypothetical proteins. The properties and statistics of the genome are summarized in Tables 3 and 4, and are compared with genomes of other sequenced gut methanogens for the order Methanobacteriales in Table 5.
a) The total is based on either the size of the genome in base pairs or the total number of genes or protein-coding genes in the annotated genome. Comparative analysis of the orfeomes of the rumen methanogen genome sequences, AbM4, Methanobrevibacter ruminantium M1 and the draft genome sequence of Methanobrevibacter sp. JHI , reveal that their gene content is largely comparable, particularly AbM4 and JHI (Figure 4). This suggests that the central metabolism and the methanogenesis pathway of these strains are similar. Methanobrevibacter sp. AbM4 is a hydrogenotrophic methanogen and the genes involved in the methanogenesis pathway, and associated functions are shown in Figure 5. The presence or absence of these genes is indicated within complete genomes of gut methanogens of the order Methanobacteriales. The methane formation pathway in AbM4 is very similar to that of M1 and each of the 7 enzymatic steps expected for the reduction of CO2 (or formate) through to methane using H2 is present. AbM4 and M1 are distinguished from the human gut methanogens, Methanobrevibacter smithii PS  and Methanosphaera stadtmanae MCB-3 , by the absence of the methanol:cobalamin methyltransferase genes (mtaABC) which mediate methanol utilization in these organisms. 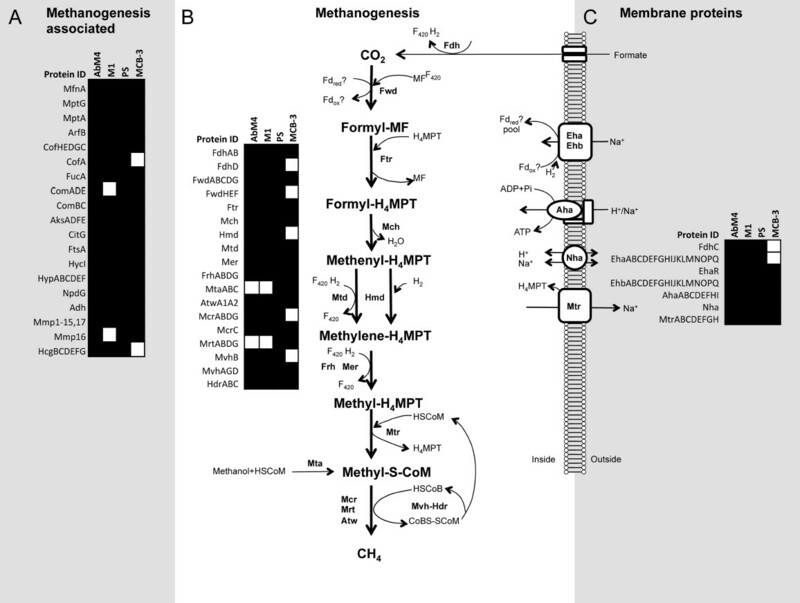 Hydrogenotrophic methanogens generally encode a methyl coenzyme reductase II (mcrII or mrt), an isoenzyme of the methyl CoM reductase I (mcrI) enzyme which is differentially regulated during growth  to mediate methane formation at high partial pressures of H2. Like M1, AbM4 contains only the McrI system for the final methyl-CoM reduction step in methanogenesis. PS contains both the McrI and II systems whereas MCB-3 contains only the McrII system. In the rumen, methanogens depend on fermentative microbes to supply H2, usually at very low concentrations, and AbM4 and M1 appear to have adapted their lifestyle for growth at low levels of H2 using the McrI system only. Comparable with M1, AbM4 contains several genes (two NADPH-dependent F420 dehydrogenase genes and three alcohol dehydrogenase genes) which may support growth on alcohols such as methanol and ethanol [2,53]. Venn diagram displaying gene conservation between the orfeome of Methanobrevibacter ruminantium M1, Methanobrevibacter sp. JHI, and Methanobrevibacter sp. AbM4. Analysis performed using GAMOLA  and OrthoMCL, Version 1.4 . Numbers within circles refer to numbers of ORFs shared; numbers in brackets refer to total number of open reading frames predicted for a genome. Comparison of predicted coding DNA sequence (CDS) content for methanogenesis associated functions from completed methanogen genomes found in mammalian gut environments. CDSs are arranged as methanogenesis-associated (A), methanogenesis (B) or membrane proteins (C). Genomes from Methanobrevibacter sp. AbM4, M. ruminantium M1 (NC_013790), M. smithii PS (NC_009515) and Methanosphaera stadtmanae MCB-3 (NC_007681) were used in the comparison. A white square indicates an absence, and a black square indicates a presence of the predicted protein listed at the left of each panel in the genome of the methanogen listed at the top of each panel. Genes unique to AbM4 as compared with other rumen methanogens (Figure. 4) and with an annotated function are enriched for type I and type II restriction-modification systems (Table 6). Compared to M1, AbM4 does not harbor a prophage but does contain a large (∼16 kb) CRISPR region (sequence coordinates 134,105-150,352 bp). AbM4 has a greatly reduced complement of predicted adhesin-like proteins when compared to M1 (29 versus 105) and it lacks non-ribosomal peptide synthase genes that have been observed in M1. Although, AbM4 does not encode genes for biotin biosynthesis, it does contain a BioY transporter which would likely allow biotin uptake from the rumen environment. Unlike M1, AbM4 does not require exogenous coenzyme M for growth as it contains the full complement of CoM biosynthesis genes. A complete set of cobalamin biosynthesis genes are also present, although they are scattered throughout the genome, rather than being clustered together as in M1. Unusually, the DNA-directed RNA polymerase B′ and B′′ subunits of AbM4 are joined, a feature only previously observed in some thermophilic Archaea . Overall, the genome of Methanobrevibacter sp. AbM4 is comparable to that of M. ruminantium M1 suggesting that the hydrogenotrophic, methane-forming metabolism of these rumen methanogens is highly analogous. The differences observed between AbM4 and M1 in the abundance of adhesin-like proteins indicates AbM4 invests less of its genetic resources on external interactions with its environment. The broader repertoire of cofactor and coenzyme biosynthetic genes of AbM4 also indicates that it is likely to be less dependent on other rumen microbes for the supply of cofactors for growth and survival in the rumen. These features suggest that AbM4 occupies a ruminal niche slightly different from that of M1. Although AbM4 does not constitute large methanogen populations, it is widely distributed in ruminant species under different rumen and gut conditions. The conserved nature of the AbM4 genes encoding these methanogenesis functions, as well as those encoding other potential targets for methane mitigation, indicates that AbM4 will be amenable to inhibition by small molecule inhibitors and vaccine-based methane mitigation technologies targeting these genes. The AbM4 genome sequencing project was funded by the New Zealand Agricultural Greenhouse Gas Research Centre as part of the Methane Objective 1.3: Genomic identification of universal targets for methanogen inhibition. Methanobrevibacter sp. AbM4 cultures were made available for genome sequencing by the New Zealand Pastoral Greenhouse Gas Research Consortium. Electron microscopy was conducted with the assistance of the Manawatu Microscopy and Imaging Centre at Massey University, Palmerston North, New Zealand.